Unlike previous entries in Ace's songwriter series, Bo Diddley wasn't a behind-the-scenes songsmith crafting songs for other artist. Sure, he penned "Love Is Strange" which wound up in the hands of Mickey & Sylvia, but he was a self-contained powerhouse writing and recording songs on his own, some of them inching up the charts but most of them becoming word of mouth standards over the years. 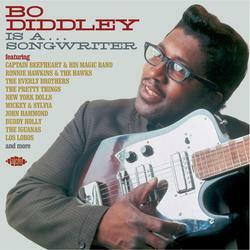 Bo Diddley Is a Songwriter collects aftershocks of those singles, rounding up covers of Bo songs ranging from Buddy Holly's 1956 take on "Bo Diddley" to a little-known 2007 L.A. roots rocker cover of "Dearest Darling." Most of the 24 songs here aren't grouped around those extremes, they come from garage rockers and British Invasion bands from the mid-'60s, along with a clutch of proto-punkers from '70s and '80s roots rockers, and while a few are obscure, most of this is pretty familiar, such as the New York Dolls' "Pills," Ronnie Hawkins' "Who Do You Love," Captain Beefheart's "Diddy Wah Diddy," the Animals' "The Story of Bo Diddley," and the Shadows of Knight's "Oh Yeah." In this case, familiarity doesn't breed contempt; it accentuates the depth of Diddley's range and influence, while the non-chronological sequencing hammers home that Bo remains a kind of rock & roll fountain of youth that rockers all of generations tap into when they need a dose of wild, wooly inspiration.